The TOBY Awards are the most prestigious and comprehensive award of its kind in the commercial real estate industry, recognizing quality in office buildings and rewarding excellence in office building management. The regional TOBY winners were honored on the Pacific Southwest Regional level for excellence in office building management and operations in specific categories of building size or type. Representing the San Diego region, Kilroy Centre Del Mar and San Diego Tech Center will now advance to the International TOBY Awards competition, which will be held in Los Angeles on June 30, 2015. San Diego Tech Center. Photo courtesy of CoStar. 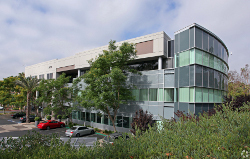 Kilroy Centre Del Mar is a 19-acre, Class A campus built from 1999 to 2002 and is prominently in Del Mar Heights. The distinctive steel-frame, five-building campus is situated amid large courtyards with water features, drought-tolerant/low-water landscaping, manicured grasses, palms and maintained grounds. Surrounded by an abundant mix of dining, shopping, hotels, canyon trails and business services, on-site and within walking distance, Kilroy Centre Del Mar provides a work environment to tenants that value green, efficient workspaces to attract and retain top talent. The campus affords employment for approximately 1,400 people, 50 physicians, and medical care for 700 to 800 patients daily, all of whom help sustain the surrounding businesses and contribute to the greater local economy. Kilroy Centre Del Mar. Photo courtesy of CoStar. 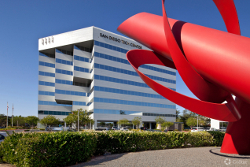 San Diego Tech Center is an 11-building campus including an eight-story office building, three two-story buildings, and five one-story buildings spanning across approximately 655,000 square feet. The 38-acre campus serves as a landmark of San Diego’s technological capabilities surrounding amenities, environment, telecommunications and tenant employee satisfaction. The newly improved campus features amenities including a 5-acre Japanese garden, Karl Strauss Brewery, private fitness center with separate aerobic studio, on-site fitness director and massage therapist, half-mile walking trail, swimming pool, tennis courts, basketball courts, volleyball courts and racquetball court. Judging by TOBY officials included review of policies and procedures, preventive maintenance, building quality and condition, renovations, tenants, amenities, staff, training, energy conservation, community involvement and emergency preparedness. BOMA San Diego is a local voice for the commercial real estate industry. The organization promotes the interests of a changing commercial real estate industry by encouraging partnerships in professional development, networking and advocacy. For more information, call (619)-243-1817 or visit www.bomasd.org.